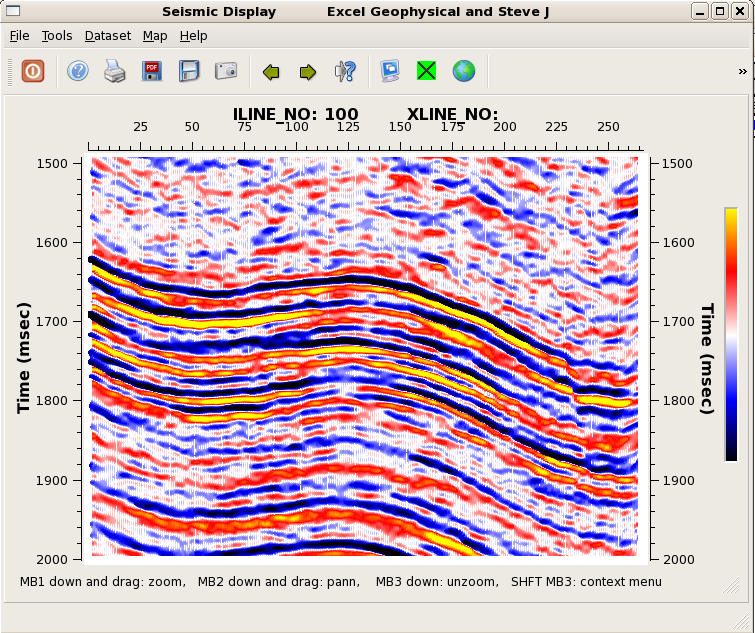 Excel Geophysical and Steve Jensen created a partnership to develop geophysical software to help in Excels seismic processing business. Excel and Steve Jensen have a leading edge library of software tools that gives our processing group the technology to deal with rugged Rocky Mountain, Mid-Continent, Gulf of Mexico, and international 3D seismic datasets.The software tools run under the ProMAX/SeisSpace seismic processing system. This is a leading edge seismic processing system created by Haliburton and used by Excel processing personnel to process 3D seismic data.Many of the software tools are used to remove noise or enhance signal in the seismic data in pre-stack or post-stack form. 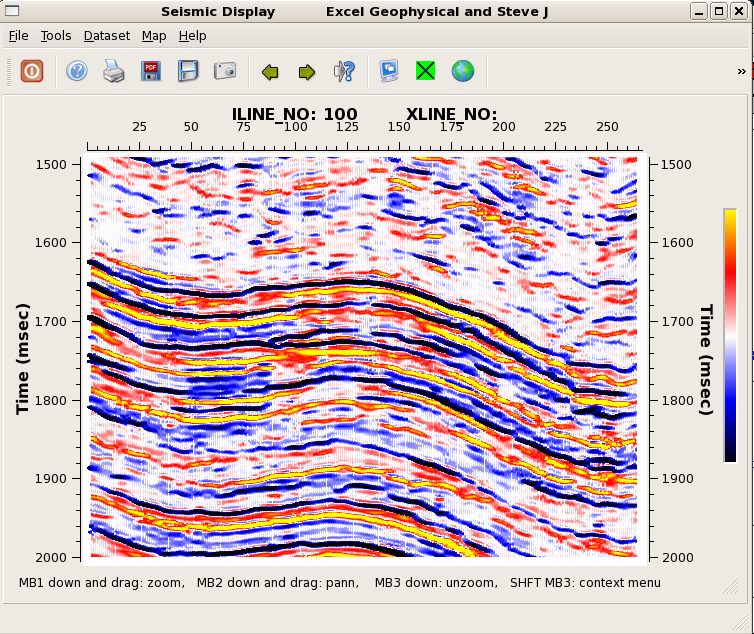 Several tools create attributes from the seismic data to reveal more information than found in the standard seismic displays. There are tools to enhance the frequency content of the data to see details that are hidden in the normal seismic display. The library has tools for azimuthal velocity analysis, cvs velocity analysis, and semblance velocity analysis. Includes tools for scaling the data, decon, NMO, stacking, wavelet and NMO de-stretching, and many more. Interactive tools in the library include Seismic Display to view and interactively process the seismic data. A number of options inside Seismic Display include: header viewing, spectral analysis, bandpass filtering, high speed image viewing, refraction picking, horizon and other ProMAX table picking, velocity analysis, load and view of SEGY files, geometry loading. Steve’s Mapper allows interactive viewing of the data in map form. Options in this tool include viewing the shot, receiver, and CDP locations, loading ASCII file geometry information, measuring distances, drawing polygons for partial extractions, view database information, computing line intersections, and mapping database, table, or dataset information in 1D, 2D, and 3D. 3D Volumetric Curvature Volumetric curvature attributes are valuable in mapping faults/fracture/folds and stratigraphic features. 3D Wavenumber Noise Suppression Suppress noise footprint in the seismic data. Special feature will smooth 3D data but leave the structural/stratigraphic geology intact. Dip/Azimuth Semblance Compute 3D dip and azimuth using semblance analysis. Option to build a model of the data and apply as a coherency filter. High Frequency Enhancement Enhance 3D seismic data by extending the usable bandwidth of the seismic spectrum into higher frequencies. Spectral Decomposition Image and map temporal bed thickness and geologic discontinuities over 3D seismic surveys. Seismic Display Interactive seismic display. 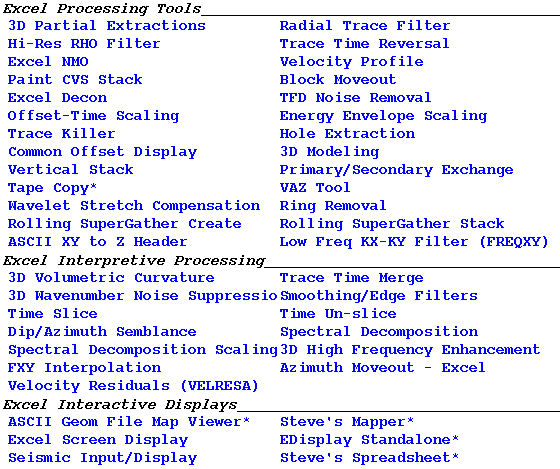 Options for spectral analysis, trace headers, first break picking, ProMAX tables, and more. Steve’s Mapper Interactively map geometry information from ASCII files or the ProMAX database. Line ties, partial extractions, print, and more. 3D Partial Extractions Extract partial volumes from a 3D cube. A set of polygons are defined where a trace can be accepted/rejected from a polygon. Hi-Res RHO Filter Enhance frequency bandwidth by applying a zero-phase filter of the form f^ex and then combine with the input. TFD Noise Removal Time-Frequency domain noise suppression and spectral balancing. Attenuates noise bursts, spikes, air blasts, and other noise. Energy Envelope Scaling Boost the amplitude of low energy zones relative to high energy zones in the data. ProMAX menu showing Excel software tools.